UPDATE: On Wednesday, April 10, 2019, the Richland County Zoning and Land Information Committee unanimously approved this project! 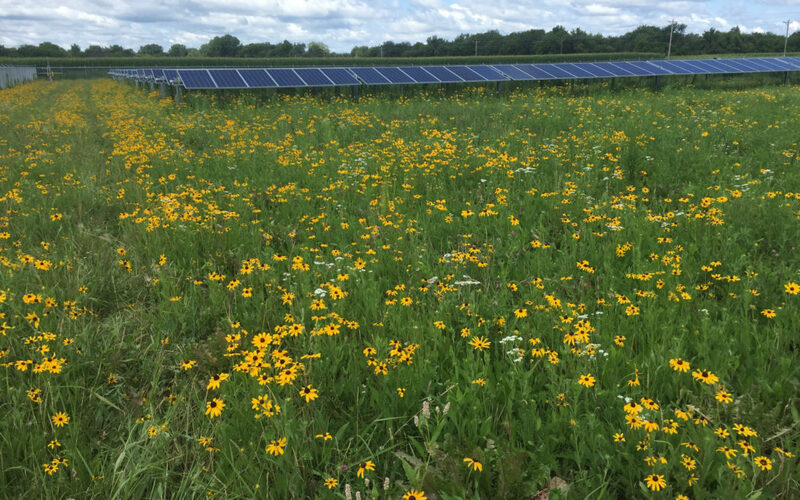 Solar farm proposals continue to spring up like mushrooms across western Wisconsin. In the last month, Tradewind Energy, a solar and wind energy developer headquartered in Kansas, submitted plans to build a 50 megawatt (MW) solar farm in Richland County near the Village of Lone Rock. Tradewind’s project would spread across 500 acres of farmland north of U.S. Highway 14 in the Town of Buena Vista. If approved, this project will generate on average about 100,000 megawatt-hours (MWH) of electricity a year, enough electricity supply for more than 13,000 Wisconsin households. Similar to the Badger Hollow Solar Farm proposed in Iowa County, the Richland County solar farm would deploy long rows of panels mounted on single-axis trackers. Unlike Badger Hollow, Tradewind plans to purchase the participating properties outright instead of entering into a long-term lease with the two landowners for the use of that land. In addition, Tradewind’s permitting path is different, because at 50 MW, the Richland County solar farm is not large enough to preempt local zoning ordinances. It will be the Richland County Zoning Committee and not the Public Service Commission of Wisconsin that will review proposed solar farm, and decide whether or not to issue a Conditional Use Permit. The project site lies within a district zoned for general agriculture and forestry. Heather Allen and I drove to Richland Center on November 5th to attend the permit hearing and communicate RENEW’s strong support for Tradewind’s proposal. About 25 people filled the meeting room. In attendance were members of the project development team, the owners of the farmland to be purchased, more than a dozen neighboring residents, and several people living elsewhere in Richland County. The neighbors in attendance communicated their concerns about the proposal. One neighbor raised the issue of glare and glint that might be experienced by those living in proximity to the project area. Because the project site is near a small airport serving Sauk and Richland counties, Tradewind contracted with a consulting firm to determine whether solar glint could interfere with air traffic flying into and out from the airport. The consultant concluded that the solar farm would not pose problems for pilots using the Tri-County airport near Lone Rock. So long as solar arrays are oriented so that they could never send glare into the control tower, they can be located at or near airports. A 2014 fact sheet prepared by Meister Consultants under a U.S. Dept. of Energy grant award notes that there are 30 airport solar PV installations operating in 15 states; the numbers are certainly higher today. One of the newest airport solar projects now operating is at Appleton International Airport, where Green Bay-based Eland Electric built a 230 kW parking canopy that supplies electricity to both the terminal and to the electric vehicles parked at the charging stations. Another issue raised by neighbors relates to the decommissioning of the project at the end of its operating life. With solar and wind projects, the permitting authority will require the developer to post a bond sufficient to cover the cost of removing the arrays as well as restoring the land to its former condition. Host jurisdictions generally don’t struggle with this issue when the facility is owned by utility or a public body. However, in cases where the proposed facility would be owned by an independent power producer, especially one headquartered in a different state or country, there is often a concern that should the company run into financial difficulties or go bankrupt, the bond could disappear or become unavailable to the host jurisdiction. As explained by company representatives at the hearing, the bond that is posted would effectively become the property of the County, off-limits to Tradewind and all other entities that acquire an interest in the array over its operating life. This arrangement protects Richland County and ensures that the solar farm will be properly decommissioned. At the conclusion of the hearing, the Zoning Committee decided to table discussion on the Conditional Use Permit and take the matter up again at its November 19th meeting, which will begin at 3:00 PM. In all likelihood, the committee will vote on the Conditional Use Permit at that meeting. Prior to the Zoning Committee meeting, Tradewind will hold a community information meeting on Thursday, November 15th, at the Lone Rock Community Hall, starting at 5:30 PM. If you live in Richland County, mark your calendars for these meetings. Richland County residents can also call or email to the County Board of Supervisors Zoning Committee in support of the project. Please reach out to us at RENEW if you want to become a clean energy champion in your community!